Editor's Note: Our Facades+ Miami conference will take place January 26th and 27th at the Faena Forum. OMA partner and designer of the building Shohei Shigematsu will be the keynote speaker. Space is still available, register here. Rotterdam-based OMA has designed three buildings nestled within a narrow plot of land between Miami Beach's famous Collins Avenue and Indian Creek Drive in Mid-Beach. The project is a significant contribution to the Faena District, a $1.2 billion project covering six blocks and integrating dynamic cultural, residential, hotel, retail, culinary, and public environments. OMA's structures are all governed by independent programs: a Forum with flexible theater uses, a Bazaar that retrofits a historic hotel with curated retail and event programming, and a state-of-the-art car park. The project responds urbanistically to two frontages: the luxurious private residential character of Indian Creek to the west, and the active public cityscape of Collins Avenue and public beaches to the east. Shohei Shigematsu, partner at OMA and the director of their New York office, led design efforts on the project. He commented: “Our creative partnership with Faena began with identity research and has evolved into urban design, programming, building-making, and scenography. These diverse investigations had a profound impact on the Forum's ability to accommodate the programmatic demands of functioning as a new typology for interaction." A central focus of the new district is Faena Forum, which opened to the public this week. The building is composed of two volumes—a cylinder and a cube— that are similar in size and can be combined or subdivided to support any type of production, from projects and commissions to performances, exhibitions, and events. The main entrance is denoted by a circular stair that descends from an impressive 46-foot cantilever. This leads up into the lobby of the building, which the architects elevated in response to concerns over rising sea levels. The design move freed up ground floor space for loading functions and helped to provide a canopy along Collins Avenue. The architects say this extended the public domain into and under the building. Shigematsu said the formal strategy of the Forum's radiused cantilevered facade was inspired by the firm's research into urban planning principles. 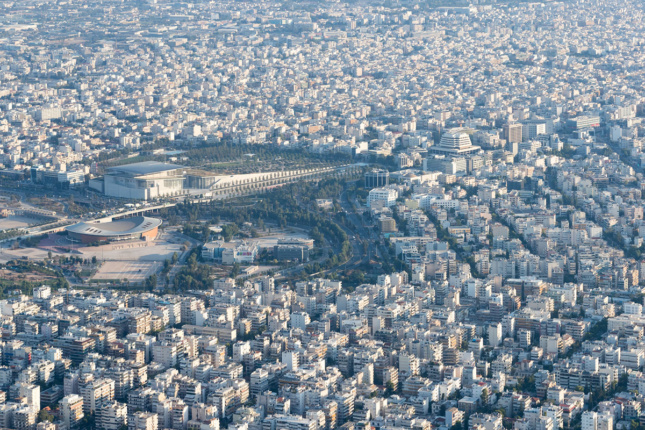 “The Forum’s circular plan enables the public domain to expand, activating pedestrian movement within the district. A 45-foot cantilever allows the landscaped plaza to slip under the Forum along Collins, providing a dramatic sense of arrival.” The Forum's cantilever and the flexible interior programming are achieved through the structural system of the building, which is essentially a reinforced concrete structural skin. Shigematsu said the unique geometry of the facade is the resultant of arches and catenary curves along stress lines generated by the main entryway cantilever: "There is a logical force movement across the facade." This curvilinear geometry was overlaid with an orthogonal lateral load bracing grid in response to hurricane-strength design loads. The resulting performative patterning of the facade yielded 360 uniquely shaped voids that were infilled with custom glazed units. This system extends onto the cube volume where diagonal bracing picked up on structural forces generated from the cylinder's volume. "There are many ways to structurally achieve a cantilever through grids but we thought these arches looked more organic like sea shells and palm trees, so we thought this was quite fitting to Miami Beach's lush nature,” said Shigematsu. Set at the opposite end of the development site, Faena Park is OMA's other new construction addition to the district. The building is a state-of-the-art parking structure with a capacity for 81 cars, as well as retail spaces at the street and top level. The 28,000 square foot structure features a mechanical system with parking lifts that stacks cars two per space for maximum efficiency. An exposed glass shaftway on 35th street reveals the vehicular and passenger movement within the building’s structure. Shigematsu said the unique automated system of car parking interested the design team: "We are quite interested in the performance of a building, so we love this kind of mechanical building." The precast concrete facade features angled perforations allowing for ventilation and controlled views, subtlety reflecting the color of cars parked within. The panels were specified in three patterning configurations—opaque, inset, and outset—and are distributed onto the facade in correlation to programmatic activity. Due to Miami's high water table, a specialized "bathtub construction" allows for continuous parking underground to support valet parking, increasing parking capacity by over 150 cars. Bookended between Faena Forum and Faena Park is a historic Atlantic Beach Hotel, which was built in 1939 and designed by prominent Miami Beach architect Roy France, whose work includes the Saxony and Versailles. Scheduled to open in Spring 2017, OMA’s design preserves the building’s original facade details, while inserting a new intimate central courtyard, unified by privacy screen and a penthouse terrace with views to the Atlantic Ocean. The privacy screen doubles as a brise-soleil and is assembled from simple aluminum channel extrusions. 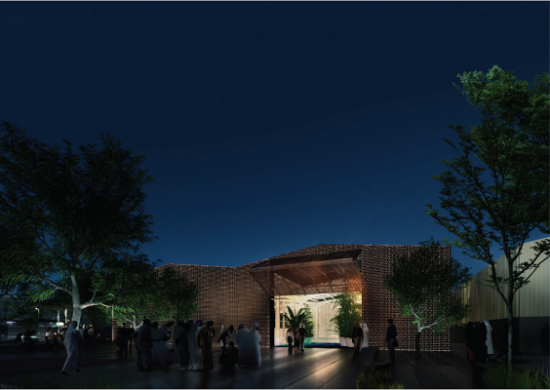 The architects say this assembly helps to define the new courtyard as a negative volume within the existing building. 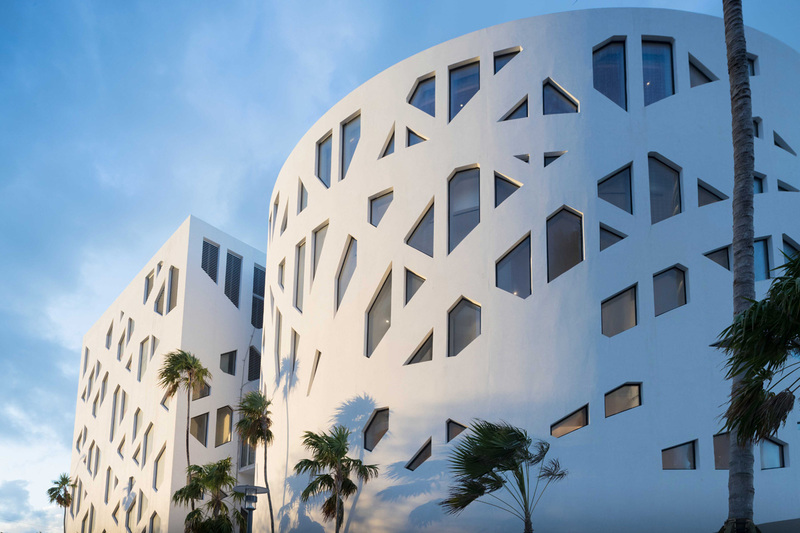 Shigematsu said OMA's contribution to the Faena District was inspired by the urbanism of the Miami Beach site: "As a firm, we always like to have a sense of urbanism reflected in the building. So actually, making three buildings next to each other with three different programs was very easy, in a way, because you can actually produce a dialogue you have full control over. The historical structure that we preserved added authenticity to the project. It looks like an organic growth of the neighborhood." Also in the Faena District, across the street, is a new tower by Foster and Partners. OMA's project was designed roughly concurrently with the tower, and Shigematsu said that responding directly to Foster's building was not a priority, although there was an interest in unifying the buildings of the neighborhood though landscape design, paving and public art. "I think the dialog between our Forum, Foster's tower, and the hotel is actually quite interesting. In the end, Foster's balconies have a round profile, and our building [the Forum] is round, and the historic hotel has a curvature on the main facade." Bernard Tschumi’s first project in Italy appears to be on hold—if it is not dead altogether. 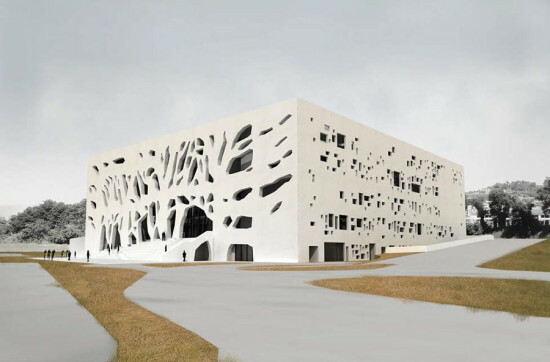 The regional Superintendence for Architecture and Landscape Heritage has blocked plans for the architect's cultural center, called “ANIMA”, which was scheduled to open in Grottammare in 2017. The announcement about the plan’s fate was made the same day a retrospective on Tschumi’s work opened at the Pompidou Center in Paris—a retrospective that includes ANIMA, which stands for arts, nature, music, action. 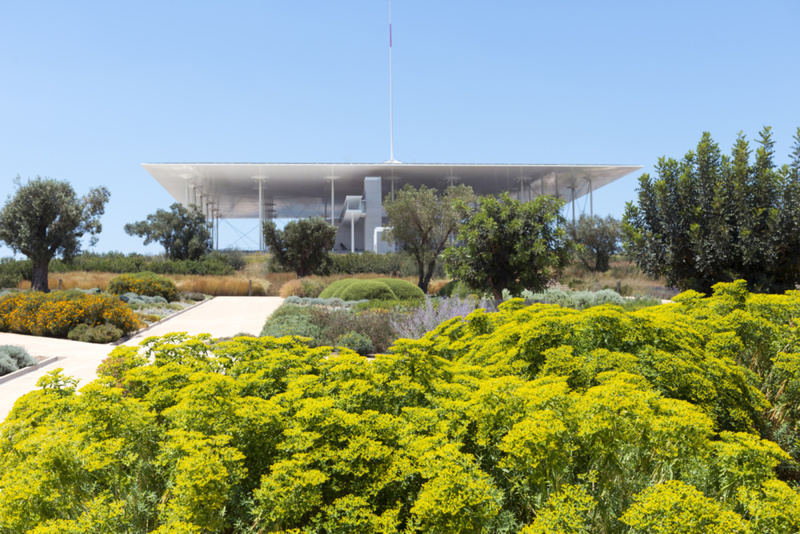 Tschumi’s perfectly square structure is encased in a white concrete facade that has varied, recessed openings to filter in light and serve as entrances. According to the firm, the exterior has a presence that is both simple and striking. Inside the roughly 100,000-square-foot space there are four interior courtyards, which accommodate various cultural programming as hinted by the structure's name. 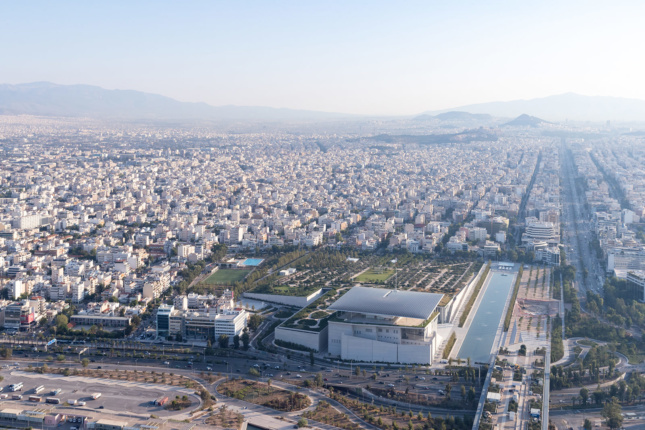 “All the different functional spaces will orbit around a central very large core: the heart of the structure, which will consist of a single ambience able to accommodate 1,500 seats that can be divided and used as a flexible and adaptable space,” explained Tschumi Architects in a statement. For now, however, the building’s future remains uncertain. Brooklyn-based architecture practice Bureau V unleashed a spectacular design for the Original Music Workshop, a new non-profit arts organization which will open in 2013 with a wide range of musical programming, from classical to jazz to experimental sound. 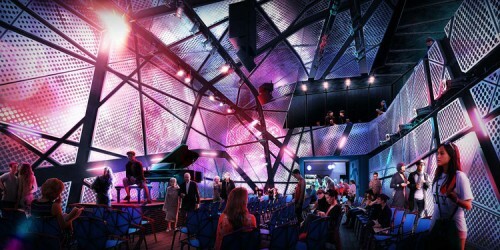 Located in the heart of Williamsburg, Brooklyn, the performance center was designed in collaboration with engineering gurus Arup and features state of the art acoustical technologies. Like any good construction in Brooklyn these days, the building is a high-tech, state-of-the-art renovation of a disused industrial building on Wythe and North 6th streets, just one block from the East River. In this case, it's an acoustic performance center with a series of variable acoustic treatments that allow the space to be tuned to specific instrumentation using acoustically isolated box-in-box construction, which minimizes background noise to studio levels inside the graffitied, hollowed-out remains of a sawdust factory. The result is a sublime collision of new and old: technology and ruin, progress and history, refinement and grit. Bureau V principal Peter Zuspan explained that OMW came to them with a "two-fold request: the space needed to be both acoustically superior and a comfortable and visually compelling space, a departure from the standard black box theater.” The acoustically-driven, geometrically complex chamber hall will accomodate 170 chairs, or approximately 350 people standing. “The space is small enough to truly listen, while large enough to foster a sense of community,” said Bureau V principal Alexander Pincus. Because of its acoustical performance features, the space can double as a recording studio for up to 70 performers. For construction photos, click here.